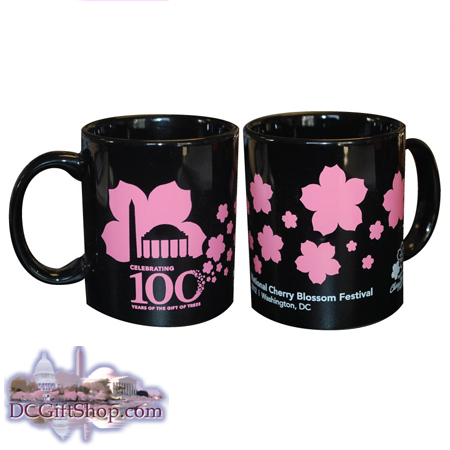 The 2012 National Cherry Blossom Festival mug is a delightful way to brighten your day with its bright pink printing and festive decorations emblazoned across it. The black ceramic mug has a nice glaze/gloss baked on it and is emblazoned with all manner of bright pink fun things: many cherry blossoms, the Washington Monument, The Jefferson Memorial, the Official National Cherry Blossom Festival logo and other writing. In pink also, the mug reads "Celebrating 100 Years Of The Gift Of Trees" and "National Cherry Blossom Festival / 2012 / Washington, DC."